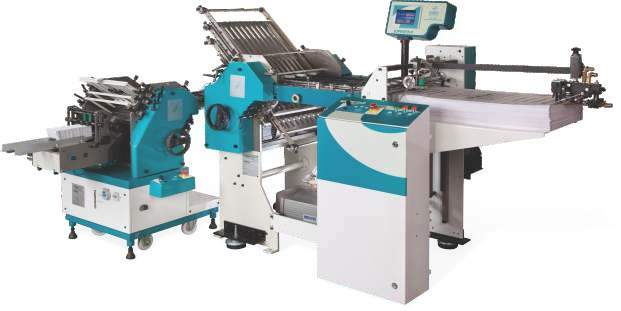 Pratham is the number one supplier of small paper folding machines. We have more than 40 different technologies developed so far, which can be used in various sectors of print finish and packaging. These automatic paper folding machines are equipped with high-speed flat pile vacuum feeder, enabling them to handle a range of coated paper, non-coated paper and bible paper with ease and efficiency. A variety of folds like single, double or triple folds with different styles such as accordion fold, U fold and double parallel fold are also possible. Our range of pile feeders can fold up to six folds to a paper whose maximum length can go up to 18 inches. The two models we offer are PGV-PF-615 and PGV-PF-618. The belt drive coupled with thick end plate ensures the machine’s smooth and low working noise. The cumbersome task of setting a new job is made easy with the availability of a caliper setting and jogging mode. An ideally located display panel indicates the folded sheets, batch count and productivity information about an ongoing job. A rotary scoring (creasing) attachment is provided at the delivery end.